Fernando Cardona in En El Séptimo Día. On the seventh day, as one best-seller has put it, God rested from all His work which He had done. José (Fernando Cardona), the vacillating hero of En El Séptimo Día, does not have that luxury. His seventh day, which indeed falls on a Sunday, is fraught with an existential crisis. José, an undocumented immigrant from Puebla, Mexico, now living in Brooklyn, is a soccer fanatic, and the star player of his team of fellow Pueblans. They’ve made it all the way to the championship in their league, but there’s a snag: José delivers food for an upscale restaurant, which is hosting a private party that Sunday for VIPs. Not only are his services necessary to keep the operations running, the day will also allow him to bus tables, moving up a rung on the restaurant’s ladder of employment. Shot entirely with nonprofessional actors, this humanistic feature from veteran American director Jim McKay hinges on a premise as deceptively simple as those Jafar Panahi movies of the 1990s and early 2000s, where the basic act of recovering a pocketful of lost money to buy a goldfish — or, in the case of Offside, attending a soccer game — achieves life-and-death gravitas. The creative solution José’s friends, and one colluding stranger, conceive, is suspenseful in its unadorned presentation. What separates En El Séptimo Día from these narrative antecedents is its specificity of people and place — Mexican laborers in Sunset Park, Brooklyn. McKay developed the first rough draft of the film back in 2001, before illegal immigration became a signature issue for frothing nativists in this country and others. But he finally shot the movie in 2016, allowing for 15 years of increased hostility, fear and marginalization to color the story’s edges. Though never overtly political, McKay includes references to ICE and to coyotes. One immigrant, who wounds his leg when his bike collides with a parked car, refuses to call an ambulance for fear of deportation, one of many factors that make day-to-day existence especially precarious. 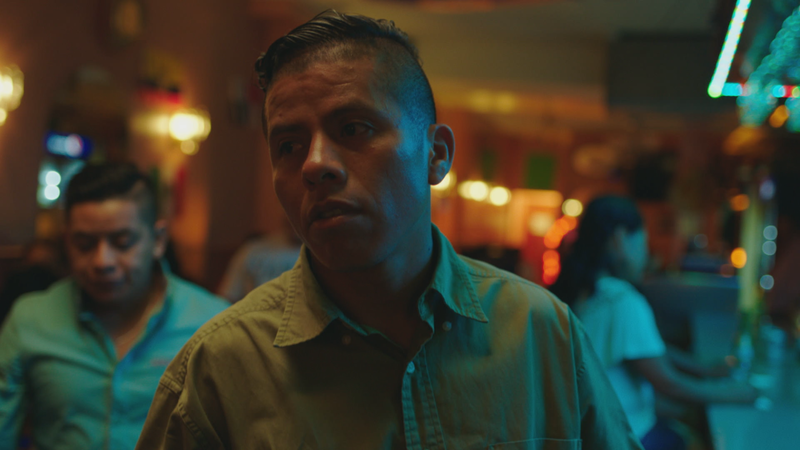 José and his fellow migrants, who share a single room in an apartment in New York City’s underground immigrant railroad, live in a bifurcated Brooklyn that’s less melting pot than layer cake, and they’re decidedly near the bottom. This is evident as we watch José go about his labor for a week of food deliveries — to an immaculate art gallery dealing in everyday transactions that equate to more than his annual salary, to the spoiled millennials of an alternative-media company in a co-working space, whose staff cannot even be bothered to show up to retrieve its order on time. The contrast with José, persuasively representing the city’s invisible heartbeat, isn’t just between a Brooklyn split between the authentic and the gentrified; it’s a matter of one America serving the other. By the end of the seventh day, as we ponder the uncertainty of José’s future, a surprise coda introduces a new character: an immigrant busker finishing up a set on a street corner, a few dollars in his guitar case. It is now the first day, and the cycle has begun again with another life on the margins — another microcosmic Everyman in search of a modest American dream. In the unlikely event this fleeting slice of life is a tease for a sequel, I’ll be the first in line to see it.